Our five different French drain systems combine to solve any basement flooding issue -- no matter what that challenges you're facing! To schedule a free, no-obligation drainage pipe installation quote, contact us by phone or e-mail today! 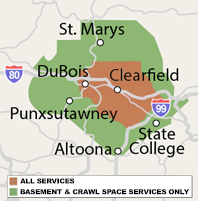 Our waterproofing specialists serve throughout our Pennsylvania service area, including Du Bois, State College, Altoona, Saint Marys, Bellefonte and nearby. We'd like to provide you with a free basement waterproofing quote for your home. Our free quotes are available to homeowners within our Pennsylvania service area and include an on-site inspection, a professional consultation, and a written, customized cost quote. To schedule your free quote, contact us by phone or e-mail today!